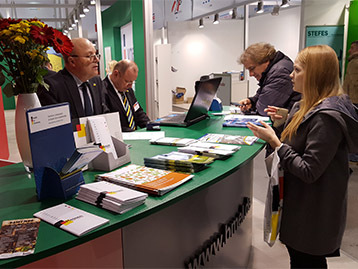 More than 500 exhibitors from around the world will present their latest developments in animal husbandry, processing and storaging of grain, vegetables and fruits in the Ukrainian capital of Kiev. Some 16,000 expected business professionals will meet on a remarkable international presence. Five national pavilions from Germany, France, the Netherlands, Great Britain and Denmark will feature around 90 exhibitors. This strong presence of national and international manufacturers as well as dealers of agricultural technologies clearly underlines the upward economic trend in Ukraine. The Ukrainian import figures for agricultural machinery doubled in 2016 as compared to 2015 and the latest business climate trend shows a more favorable rating among plant breeders and in the animal husbandry sector than in the first half of 2016.